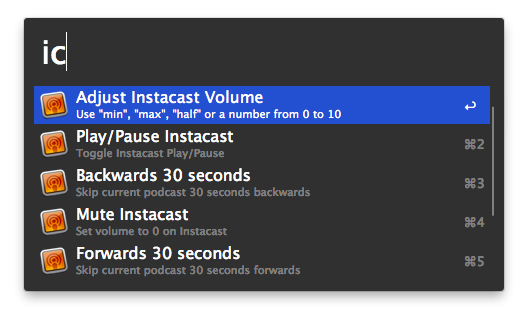 Interect with Instacast for Mac via Alfred. icp - Toggles Play/Pause icv - Controls volume. (Accepted params are "mute", "min", "max", "half" or any number from 0 to 10) icm - Instantly mute Instacast icf - Forwards current podcast 30 seconds. icb - Backwards current podcast 30 seconds. It's pretty basic right now, but I got some ideas and think to add them in a near future. Latest version of Instacast that supports AppleScript natively. Tested with "1.1 (2079)"